Unwrap the toffees and place in a small pot with the cream. Heat the cream and toffees on a very low heat until the toffees have melted completely. Add the salt. Stir the sauce and cool in a glass jar. Place the biscuits in a food processor and pulse until you have fine crumbs. Melt the butter and syrup in the microwave in a small glass bowl and add to the crumbs. Pour the butter over the crumbs and pulse until the crumbs start to stick together. Spread in the bottom of a loose-bottom pan. Refrigerate until needed. 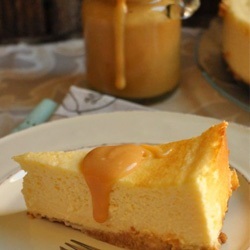 Place the condensed milk in a glass bowl and add the lemon juice. Stir and allow to thicken. Add the cream cheese, egg yolks and cream and whisk until all lumps are smoothed out. Beat the egg whites until stiff peak stage and fold it into the cream cheese mixture. Switch the oven off and then leave cheese cake to cool off with oven-door open. Recipe reprinted with permission of Nina's Kitchen. To see more recipes, click here.